It was very presumptuous of me to actually think I could write a series on depression. The more I research the subject the more I realise that it is not for hacks (like myself) to blog about. It is a very difficult and complex issue. So I shall only share my own notes with you. Please note I am NOT a doctor or a psychiatrist or psychologist…I have no training or expertise. Just my own notes. I am sharing because it is so fascinating! Whilst there is a lot of commonality between the two – they are separate conditions that requires different treatment! Furthermore,the symptoms often overlap, and one can suffer from GAD and depression at the same time! People suffering from anxiety often find themselves feeling like something bad might happen and they’re worried it will. People suffering from depression often assume a bad future and don’t expect anything else or think there’s anything worth preventing. The term “anxiety disorder” refers to generalized anxiety disorder (GAD) which is a condition that describes a situation when a person experiences stress for no particular reason. GAD patients worry excessively, uncontrollably, and irrationally about normal situations to the extent that they have trouble functioning because of their fears about money, death, family, relationships, and work. People with GAD might feel tired, fidget, have constant headaches, feel nauseous, and have pain all over the body. Other symptoms of GAD include trouble swallowing, rashes, hot flashes, and problems breathing. 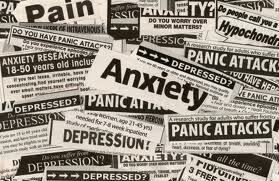 The physical symptoms of anxiety can be as disturbing as the emotion itself. A powerful anxiety attack will cause moments of intense fear. During a panic attack one may experience increased muscle tension and rigidity, an accelerated heart rate or palpitations, light-headedness, chest pain, shortness of breath, a dry mouth, trembling, sweating and clammy hands, a queasy stomach, nausea, and perhaps even diarrhoea. A panic attack might occur in response to a particular situation or for no reason at all. My BFF Marlene, who died of a heart attack in 2011 suffered from panic attacks. She feared the panic attacks themselves, as they were overwhelming and unpredictable. The first couple of times she thought she had a heart problem (which she did). Her fear compounded the attacks. Her anxiety manifested itself through pronounced restlessness (restless legs), fidgeting, clenching her hands and grinding her teeth. There is a free anxiety test that can help. It is possible to have a combinations of both. This is called a “comorbid” condition. Symptoms may overlap as both share similar causes, issues, etc. Depression can occur after someone experiences anxiety, because someone who deals with severe anxiety may end up feeling drained and hopeless once their anxiety or anxiety attack is over. Similarly, those with depression can still fear certain things getting worse, despite already being of the belief that the future is less positive or bright. Although the physical symptoms between anxiety and depression can be very different there are similarities. Both anxiety and depression can leave you feeling drained and fatigued. But in the case of anxiety, the intense fatigue usually occurs after intense anxiety, while with depression it tends to be more constant, without necessarily any triggers. Depression tends to have fewer physical symptoms, but the mental symptoms can be so dangerous (especially the potential for suicidal thoughts) and the lack of energy so pronounced that many people with depression deal with intense struggles daily that certainly rival the symptoms of anxiety. I found an excellent article that reads easily. Getting rid of anxiety disorders isn’t the same as taking out the trash. If you take your trash out to the curb, it’s gone forever, and won’t come back. But when you try to dispose of chronic anxiety, you often find that this task is more like the child’s game, “Whack a Mole“, than it’s like taking out the trash. Each time you hit a mole, more moles pop up. Every effort that you make to fight against anxiety, invites more of it. So you need to be able to work smart, not hard, to overcome anxiety disorders. This guide will help you do that. The fears, phobias, and worry that you experience with chronic anxiety disorders often seem “irrational”, and difficult to overcome. 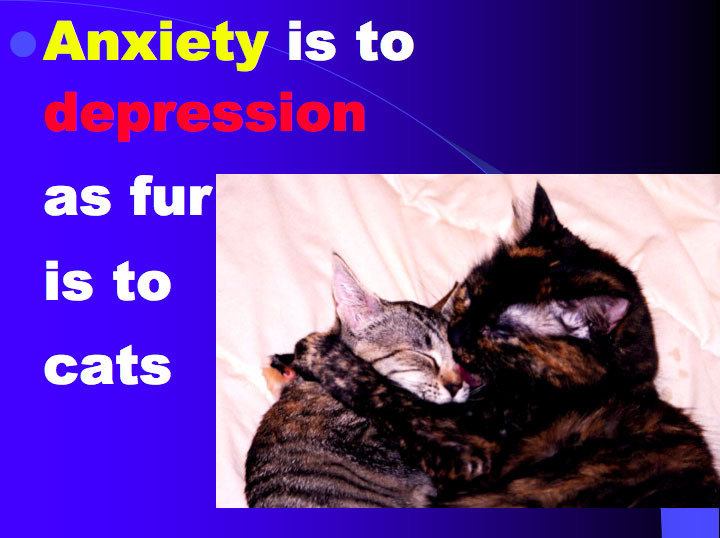 That’s because there is a “Trick” to chronic anxiety problems. Have you ever wondered why fears and phobias seem like such difficult problems to solve? The reason is that chronic fears literally trick you into thinking and acting in ways that make the problem more chronic. You can’t learn to float through anxiety disorders if you don’t understand the Anxiety Trick. The outcome of the Anxiety Trick is that people get fooled into trying to solve their anxiety problems with methods that can only make them worse. They get fooled into “putting out fires with gasoline”. There are six principal anxiety disorders. The fears are different, but each one relies on the same Anxiety Trick, and draws upon the same kinds of anxiety symptoms. And in each case, the person tries to extinguish the fears by responding in ways that actually make the problem worse and more chronic. Here are the key fears, and typical responses, of the six main anxiety disorders. A person with Panic Disorder and Agoraphobia fears that a panic attack will disable him in some way – kill him, make him crazy, make him faint, and so on. In response, he often goes to great lengths to protect himself from a panic attack, by avoiding ordinary activities and locations; by carrying objects, like water bottles and cell phones, that he hopes will protect him; by trying to distract himself from the subject of panic; and numerous other strategies will ultimately make the problem more persistent and severe, rather than less. The fear of driving is often a part of panic disorder. A person with Social Phobia fears becoming so visibly and unreasonably afraid in front of other people that they will judge her as a weak, inadequate person, and no longer associate with her. In response, she often goes to great lengths to avoid social experiences, hoping that this avoidance will save her from embarrassment and public humiliation. However, her avoidance of social situations leads her to become more, rather than less, fearful of them, and also leads to social isolation. The fear of public speaking, and the broader fear of stage fright are considered to be specific instances of Social Phobia. A Specific Phobia is a pattern of excessive fear of some ordinary object, situation, or activity. A person with a fear of dogs, for instance, may fear that a dog will attack him; or he may be afraid that he will “lose his mind”, or run into heavy traffic, on encountering a dog. People with phobias usually try to avoid what they fear. Unfortunately, this often creates greater problems for them. Not only do they continue to fear the object, but the avoidance restricts their freedom to enjoy life as they would see fit. A specific phobia is usually distinguished from Panic Disorder by its narrow focus. A person with a fear of flying who has no fear of other enclosed spaces would likely be considered to have a specific phobia. A person who fears airplanes, elevators, tunnels, and bridges is usually considered to have Panic Disorder or claustrophobia. However, the fear of public speaking is usually considered to be a part of Social Phobia. A person with a Blood Phobia may fear a variety of situations, but they all involve the prospect of seeing blood. A person with a fear of vomiting (either fearing that they will vomit, or that that they’ll see someone else vomit) would be considered to have Emetophobia. The official definitions of some of these disorders will change in 2013, so don’t get preoccupied with the label. Whether you have one or multiple phobias, these are very treatable conditions. A person with Obsessive Compulsive Disorder experiences intrusive, unwelcome thoughts (called obsessions) which are so persistent and upsetting that he fears the thoughts might not stop. In response, he tries to stop having those thoughts with a variety of efforts (called compulsions). Unfortunately, the compulsions usually become a severe, upsetting problem themselves. For example, a man may have obsessive thoughts that he might pass swine flu on to his children, even though he doesn’t have the flu himself, and wash his hands repetitively in an effort to get rid of that thought. Or a woman may have obsessive thoughts that she left the garage door open, and repeatedly check the garage all night in an effort to stop thinking that. Not only do these efforts fail to rid the person of the unwelcome thoughts, they become a new form of torment in that person’s life. A person with Generalized Anxiety Disorder worries repeatedly and continually about a wide variety of possible problems, and becomes so consumed by worry that she fears the worry will eventually kill her or drive her to a “nervous breakdown”. In response, she often tries a wide variety of “thought control” methods she hopes will enable her to “stop thinking about it.” Distraction is one such effort. Unfortunately, the effort to stop thinking about it actually makes the worrisome thoughts more persistent. A person who has witnessed or experienced some dangerous or life threatening event (a shooting or a car crash) fears that the subsequent thoughts and powerful reminders of that event will lead to a loss of control or mental illness. The powerful symptoms of fear and upset a person experiences when recalling a terrible event are reactions to that event. However, the person gets tricked into responding to these reactions as if they were warnings of an upcoming danger, rather than reminders of a past one. Thank you but you are an expert. Love your blog. It is very insightful! I am glad you have conquered depression and anxiety!! Thank you for your generous words. Great blog, long read, but Iove how you broke the blog up to show the difference, and I agree, there is a HUGE difference between both. At some stages of my life I suffered both. Anxiety is a horrible thing. Thinking something bad is going to happen and being afraid. With depression you almost want something bad to happen, self harming etc. They are both horrible things to have….Good blog T in bringing it all together so people know the difference. And I also agree, anyone unsure should see a Dr. Excellent post and very well researched. I found that using some techniques on Tom Woods’ blog on http://curefearofpublicspeaking.com/ really helped me to cure my fear of public speaking anxiety.